Roasted red peppers are one of my favorite things on earth. They’re sweet, smokey, and full of flavor. I like to blend them into hummus, toss them onto pizzas, salads, sandwiches, and more. The problem is that they can be kind of expensive. 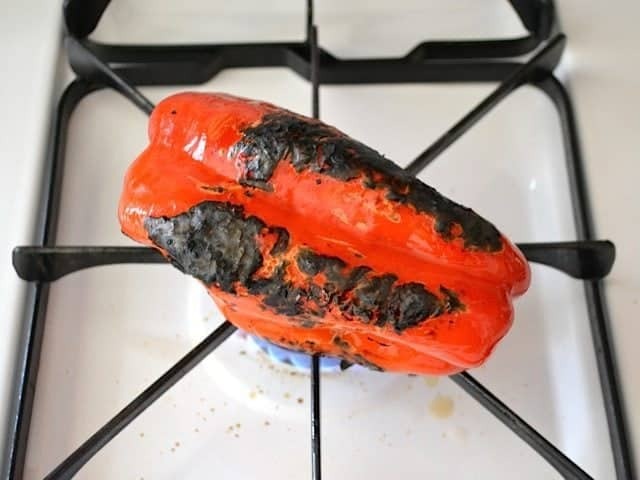 Normally I can find a jar of three whole peppers for around $2.00, which is often less than fresh red peppers cost in my area, but when I find a deal on fresh red peppers, I like to roast them myself because they taste so much better. Even better yet, you can freeze the peppers after roasting so that you have them on hand whenever you want to use them. Regardless of which method you use, you’ll want to coat the outside of the peppers with a little oil. Just smear a teaspoon or so over the surface of each pepper. I used olive oil, but you could use any oil that is stable in high heat (vegetable, canola, peanut, etc.). Turn the burner on to high and set the oiled pepper right on top. Allow the pepper to blacken on one side, then use tongs to turn the pepper. Let the pepper fully blacken on all sides. You want the peper to blacken even more than this pepper is in the photos. All of the black, burned skin will be removed later, leaving a tender, smoky flavored flesh. The pepper will spray a bit of juice onto the cook top, which is one reason I didn’t like this method. The juice burns and then is kind of difficult to clean off. After the pepper is blackened, place it in a heat proof container with a lid. This will trap the steam and help separate the skin from the pepper. Leave it in there for about 15 minutes, or until it is cool enough to handle. I just used a large glass bowl with a plate inverted over top as a lid. 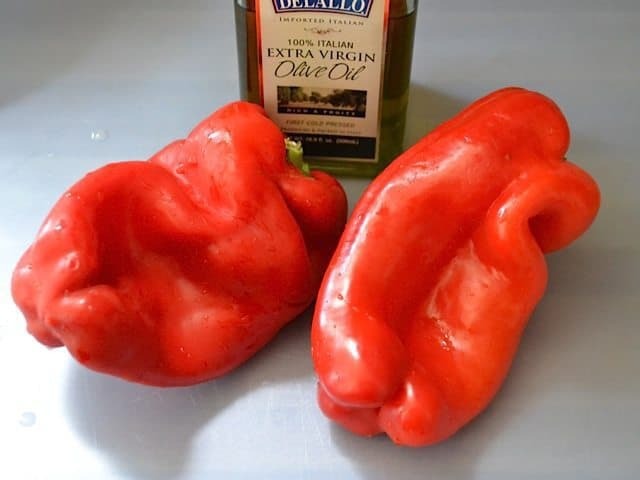 Coat the peppers in oil, just like with the gas burner method. 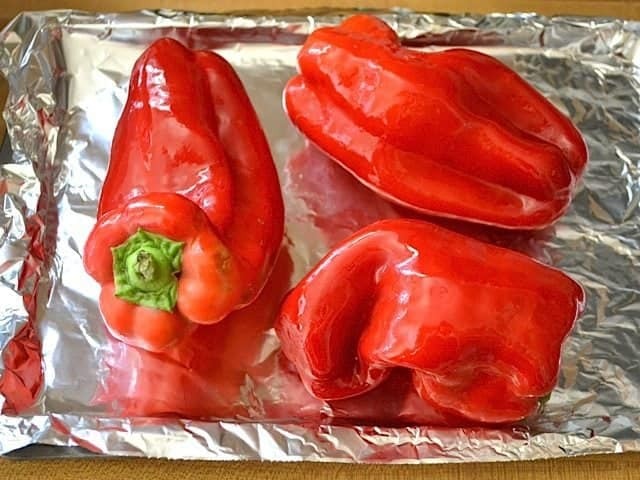 Place the peppers on a baking sheet covered with foil. Adjust your oven rack so that the top of the peppers will be a few inches from the broiler. A lot of broilers are at the top of the oven (the heat element hanging from the top inside the oven), but some are in a drawer underneath the oven – that’s how mine is. A broiler works just like a grill. You place the food very close to a source of heat to cook it quickly. Cook the peppers until well blacked on one side, turn the peppers and cook until blacked again. Repeat this until all sides are blackened. The amount of time needed to blacken the peppers will depend on how close the peppers are to the broiler, if the peppers were cold before beginning, and the size of the peppers. Mine took 8 minutes on each side, but they had been in the fridge just prior to broiling. I would suggest taking a peek at them every three minutes to check the progress. Place the peppers in the covered dish until cooled, just as before. 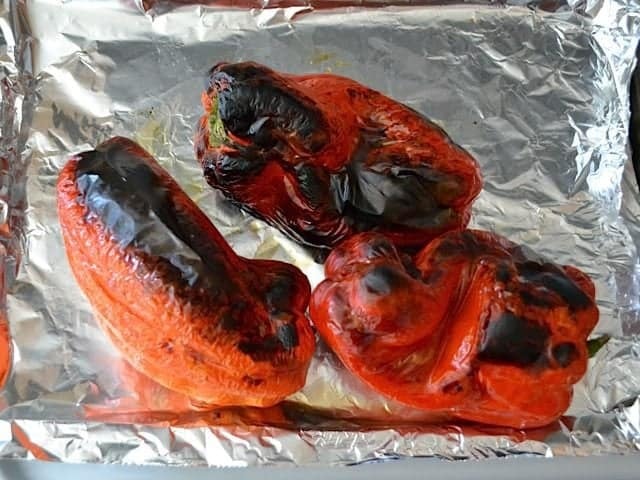 The skin of the peppers roasted under the broiler peeled off in nice big sheets. So easy. Remove all of the skin, just as before. Of course I can’t use six whole roasted peppers within a few days, so I froze them instead. Remove the stem, seed pod, and scrape out the seeds from the iside of the pepper. Do this over the sink or garbage can because the peppers will be filled with juice. 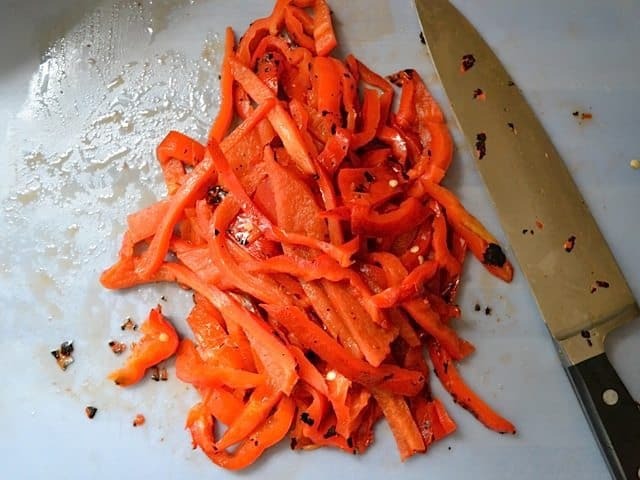 You can leave the peppers whole after removing the seeds, or slice them up like I did. Divide the peppers up into one-pepper portions so that you don’t have to thaw the whole pack when you want to use some. I used those small fold-top sandwich bags to divide the peppers up. 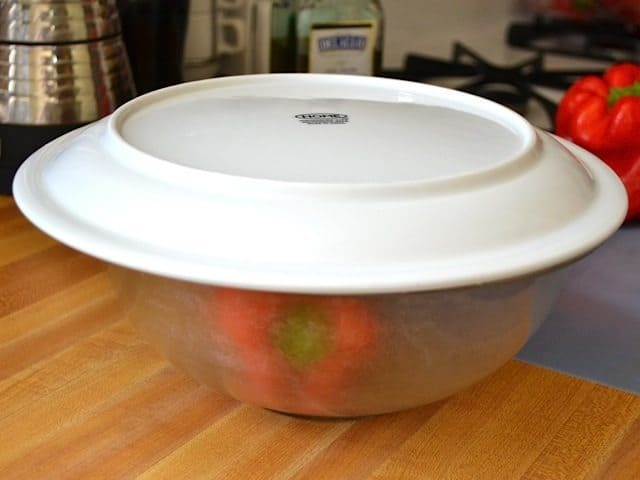 Then, place the divided peppers into a freezer-grade storage back to keep air and freezer burn out. When you want to use some, simply take one little bundle out and let it thaw! It should thaw quickly seeing as it is such a small portion. 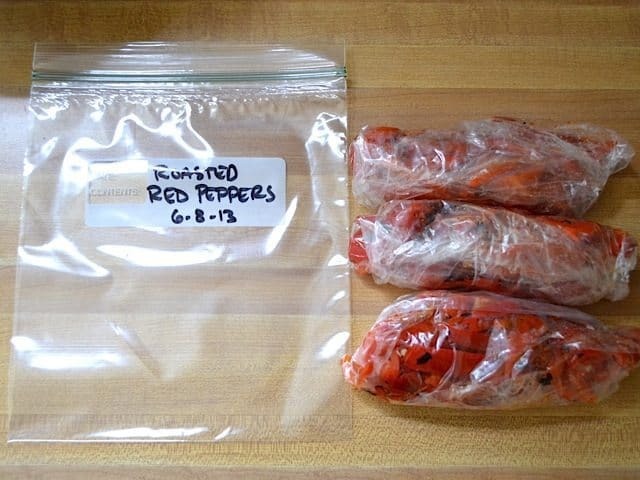 Try to use the peppers up within 4-6 months as they can tend to dry out in the freezer when stored for extended periods of time, even when wrapped well. Oh man, I made these and then used them for your creamy roasted red pepper sauce. We ate is warm with some crusty bread. It was heaven and made the red pepper sauce even more affordable to make. Awesome recipe as usual! Have you done this with more than red peppers? I usually get green, orange and yellow too and wondered if the results are the same. 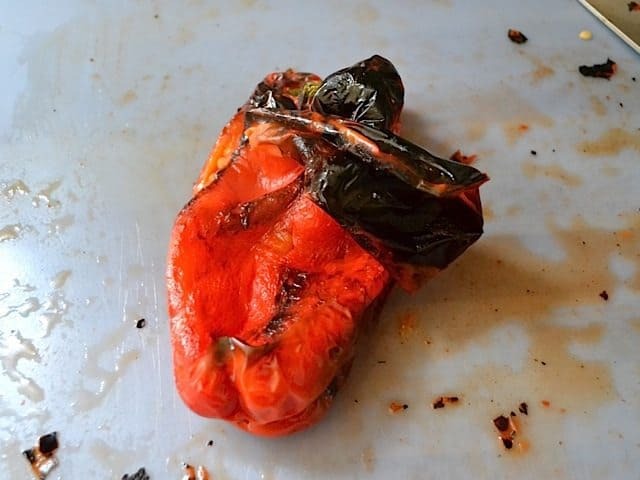 You can definitely use this technique with other peppers. Red, yellow, and orange are better than green just because they’re sweeter. Poblano peppers are also awesome roasted. I cannot, for the life of me, find poblano peppers (or decent Hispanic produce/spices) in London without venturing at least an hour across the city. However, I can get these red peppers down the road for cheap(ish). I shall stop moaning about no poblano peppers and experiment with them! I cut the peppers in half and threw them on the grill when cooking the London broil and they turned out perfect! I’m going to pick up a bunch more tonight, grill them and stock up my freezers. Just made these today, ended up combining the peppers with some seasoned chicken , pasta sauce and Feta cheese. The result was heavenly thanks to how good these peppers tasted! I’ve been wondering how to do this! :D Thanks for clearing it up. Will be trying it soon. I love to add them to fettuccine alfredo. 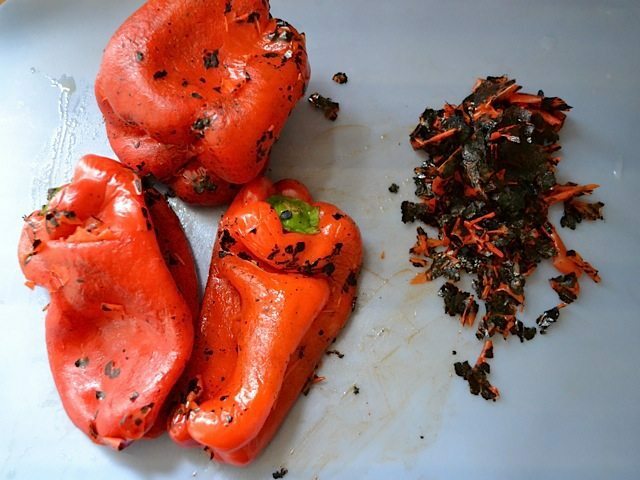 I roast my red peppers using the broiler method, but before broiling I cut the pepper into quarters and deseed. This lets me be lazy and avoid flipping the pepper a few times under the super hot broiler. I agree it’s great to have a freezer stocked with freshly roasted red peppers! We don’t have a Trader Joe’s in New Orleans, but I sure wish we did! I keep hearing such great things about it. Your recipes are far better, easy, and taste delicious as always. I originally came by to say, I love how you pur how/what to store things in the freezer. During the hot months, I throw mine into the toaster oven on broil for 20 minutes! The grill is the only way to go! Especially in the summer. Also, why would you peel all the grilled, charred goodness off the pepper? Just my preference, but oh, so good!